How can I edit the amount of questions in my Pulse survey? Firstly, go to the "Surveys" section of your account and click on "Edit" on the right side of your Pulse survey. Please note: the Pulse survey can only be edited when it is inactive! 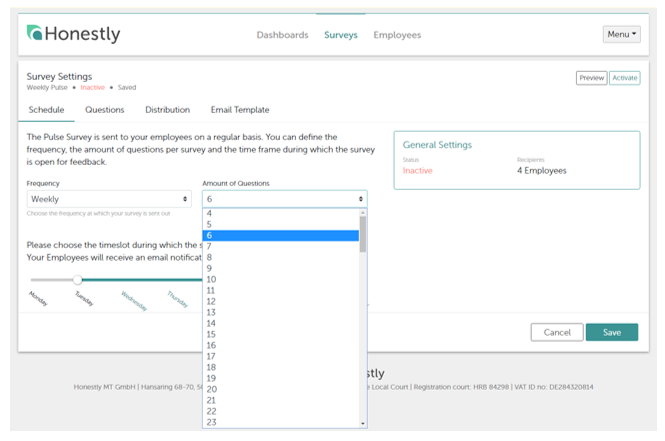 In the "Schedule" section, you can select any number of questions, from a minimum of 6 to a maximum of 116. Although the Pulse survey contains 119 questions, only 116 will be shown here as only one of the 4 Open Questions will be asked each time. If you choose to select all questions, please note that the answers to some questions may influence the way others are answered. To read about what else you can edit in your Pulse survey, click here.